Hi I though I would start this off as a general chat about all the Donegal lines. However I am doing some research into the Donegal Station at Stranorlar, So far I have about 50 odd photos from various sources and I have a few more to come, what I would like to ask is if anyone has any unpublished photos of Stranorlar in the late 1950's and early 1960's just after the railway closed or before the buildings where demolished. I have already realised that a 4mm scale style model is possible (20ft x 8ft), but on looking at different photos, I have come across a number of unique Donegal make do and mend buildings around the Carriage and Wagon Works. While some of the buildings can be build as per a photo much of it will still be guess work. I would like to thank the Donegal Heritage group for a whole lot of help so far, any information I get I plan to donate it all to the CDR Trust at Donegal at some point. I think a visit later this year is now in order. Colin, did you ask the IRRS for any unusual views? They are great, I have to admit that it was one of your photos which got me thinking about Stranorlar as a model, the more photos I find the better my understanding of the station becomes. For instance I did not know that part of the carriage works where just covered tracks made out of old rail and corrugated sheeting and that the C&W building was the old transfer shed in the days of the dual gauge operation. Its the little bits which make this so interesting. I see the copyright is one James Payne. It’s not a new photo - it appeared in Dr. Patterson’s Definitive history of the CDR which was published about 1969 or so. I wonder where the rest of his collection went? No I haven't as yet, but I have asked the Donegal guys for some help and they have come up with about 60 photos so far. I will have to ask them at some point once I have all those photos I know about in one place. It would be interesting to find out, it is worth keeping a look out on eBay for photos and other such stuff. The only problem is that some sellers think they can make a lot of money out of Irish Railways, i was once offered a Donegal to Ballyshannon return ticket for £50.00 uk pounds i had to break the news to the seller that the heritage center in Donegal was selling the same tickets for 1 Euro at the time. Somewhere i have a box full of Donegal tickets which i picked up years ago for a £5.00, I think they are remainders and have not been issued or used, if you have a used ticket, well that is another matter and could be worth a few bob, but the condition and the places named on the ticket will make all the difference. Yes, I’ve been following railway artefact prices for forty years, buying and selling the odd thing. Prices on eBay for such stuff - including tickets and photos - are grossly overpriced far more often than bargain-based. The IRRS archive contains much stuff, but it’s only open on Tuesday nights, so research really requires time spent in Dublin. For what it's worth, I bought a copy of Michael Bunch's Donegal Railway Diary, Part one, at the weekend. Must admit that, initially, I was very disappointed, because the quality of the photos is poor. Overall, I would say close to 50% are grainy, or simply out of focus, while another 25% are poorly composed. However, I'm now warming a little to the book, because if nothing else, it is a unique archive of hard to find views of the more obscure elements of the CDR. It also contains a wealth of generic details, such as platform clutter, piles of parcels, line side and track details, close ups of wagons and coaches, etc. It is just a shame that so many of the pictures are poorly composed/exposed/focussed. Sift through though and there are some real gems, while the price at 15 euros is pretty cheap for an A4 album of 148 pages. Thanks John that is one photo I already have. I see the value has gone up over 1000% if there is such a thing, I got a copy from the London branch of the IRRS a few years ago for about £3.50. That's the trouble with ebay, Colin! I had a look among jhb171Senior's stuff, and there's nothing from Stranorlar that's "off the beaten track" as such. For the times he travelled on the CDR, he didn't take many pictures, unfortunately. I guess you have Roger Cromblehome's book, "County Donegal Railways Companion" published by Midland Publishing in 2005. It has numerous photos drawings etc of the Donegal including Stranorlar. If you havn't cheapest source is Amazon UK £9.99 plus £2-80 postage. I met Roger once on Limerick station and think he is the chap who does the Alphagraphix kits and buildings. Hi John very true and thank you for looking, I hope someone has a photo of the following item which has so far provided to be somewhat elusive in photos, this one building which up to now has only lurked in the corner of the odd photo is the old Carriage and Wagon workshop, at the Strabane end I am convinced that it was the old Transfer shed when Stranorlar was duel gauge, over time this was modified and a learn to type of build was added. Going to the Donegal end, I have only so far found part of a photo which shows the sheds to be made of corrugated tin and possible old rail used as upright post's. What is interesting is that while Dr Patterson's book gives a track plan for Stranorlar, if you then look at the photo evidences which is about, it does not line up with so far any fixed date of operation. There are a number of things which have changed over time, one notable building is the old loco shed older photos show this to be made from wood, yet by the time of closer this had been rebuild in some sort of stone and or breeze block. Another thing is that most Donegal stations only got whitewashed (some photos show this to be more of a cream colour rather than whitewash) in later years, I am not sure as to when this happen, but some photos I have show the station building in plan stone finish. My best guess is this happen when the Red and Cream livery was introduced. Unless I wanted to build a dead scale model of Stranorlar at a fixed point in time, then the best I think anyone can do is to build almost a freelance version of the station, but with all the bits that take your fancy. Yes I do have the book and I have also been in contact with Roger, I have been trying to get him to do some more Irish buildings, but he tells me he is very busy at the moment, I have also asked him to do some Isle of Man buildings as well (Douglas as a starter). I have to admit that the dream layout is a bit bigger than the back of the proverbial fag packet which started this all off years ago. Colin, first of all well done if you have a go at modelling the County Donegal. Most Irish narrow gauge railways were supercharged with character, from our modern perspective, although the actual local environment in the 1950s and before would have been dominated by other factors. Also, at least as far as Co. Donegal was concerned, the railways were THE transport system - useful to bear that in mind. But from my comfortable, warm armchair nowadays, they were simply fantastic railways. However, what I meant to say was to support your conclusion of not trying to build a 100% exact model of a particular station, but rather apply a bit of artist's license when you cannot find pictures for all the buildings and details. Most railway companies seemed to build according to their own style, which is logical, so if you do not know the details of the Stranorlar carriage workshop except that it was made of wriggly tin, then why not scour the available photographs for similar sheds and sketch up an approximation from what you find? Personally I would go for something that is 3/4 accurate, but including as much of the right character as possible. Good luck! Thanks for the above, I have had a chat with a few local modellers over here and all the usual comments like you are mad to take on such a large design, etc. One thing I will do and if I see something which is very close to the prototype then I might use it on the model, but so far I have a few items I can use, I am currently looking for a building which is almost like the general stores building which in on one of the platforms, I was thinking in terms of using a couple of the Dapol Engine shed kits as a basis, but I haven't had a good look at what is out there right now. Just a Word to the Wise, emphasising what JHB said - there are folk out there who think people will pay any amount for anything! Where TICKETS are concerned - a few do make impressive prices at auction, but the Co Donegal and the Swilly (particularly) are pretty common - most are what the ticket men call "audits" - i.e. returned as unused. A Euro is probably a good price for a seller to get for them. USED tickets are a different kettle of fish. As for photos ..... That view of Stranorlar station is not hard to come by so asking thirty quid for it is just having a laugh. While doing some research and starting to read the book that old sinner, I came across some interesting facts about the proposed railways in Donegal. One concept which I have come up with is that a new link was built to run directly from Stranorlar to Letterkenny. 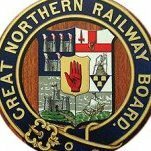 One of the stations on the Strabane and Letterkenny Railway which would have been effected was the halt at Cornagillagh and also the station at Glenmaquin. If anyone can point me in the right direction for photos of either or both locations I would be grateful. Why stop at something like that when you could model Keady, complete with the Connaught narrow gauge going underneath the GN by the tunnel WHICH IS STILL THERE! In fact, why stop at that, pretend partition never happened, the Keady line stayed open, so you could have CIE diesels on the broad gauge and West Clare type F Class diesels on the Connaught Express on the narrow gauge? What's this stuff in my glass - I must stop drinking Black Bush at night! There is also the scenario of the Midland Great Western extending the Kingscourt branch through to Armagh to a connection with the NCC at Cookstown. The Kingscourt, Castleblaney and Armagh railway was planned as part of an inland route from Dublin to Cookstown and possibly Coleraine. The Carrickmacross branch appears to have been built as a blocking line by the GNR. Thanks guys the more I get to know the less I understand, just looking up all the proposed railways around Ireland is a subject all by itself. From my own view on the Lynton and Barnstaple Railway In North Devon, there where at least three may be four creditable alternatives to the final L&BR which got built. I know about the two proposed extensions to the CDR one to Teelin Pier from Killybegs and the other was only a proposal was to extend the line from Glenties to Ardara harbour. The book I have only goes into some detail about the proposed lines to Burtonport, so I am sure there is lots of wiggle room for other fanciful concepts. Sadly the pills don't allow me to drink any Bush mills at the moment. I know of a restaurant in Killarney which has 1600 whiskeys! Not just Irish, but from all over the world. Few will know that there's such a thing as Vietnamese whiskey! If you examine just about every railway line in Ireland - and, as you appear to be in Britain, there too - there were often numerous schemes to build or extend, differing proposals on gauge, route, facilities, and whether it should be a local company, administered by the local authority, or part or wholly owned or operated by the nearest neighbouring "big railway company". A bewildering array of proposals and county proposals - yes, as you suggest, major fodder for not just a book, but a series of them. The great thing about a proposal is that if you take buildings of an established line, I always get surprised when someone at an exhibition states they have stood on the end of that very platform. That has happen to me three time now, and each layout is from the imagination of the builder, yet people say they know exactly where the station has been. Shows how realistically you're modelling things! Hi John I must admit my modelling isn't that good it is down to the other guys whose layouts I have helped operate that have done more modelling than me, they some how manage to get it right most of the time. John remarked on the MGWR intentions re Northward expansion and the GNR answer by building the line to Carrickmacross. In 1940, or 1941, there was a distinct danger of the little Austrian invading the UK via the Free State. In such a situation, the Brits expected to be invited to help repel the Wehrmacht. They realised that with just the GN mainline, plus possibly the Cavan lines and the SLNCR, they were in danger of having their line of logistics cut off. So two young engineering officers were told to put on civvies and do a preliminary survey to estimate how long it would take to extend the line North to Carrick and so produce a further supply line. They duly did this and one of them, later the UK Inspecting Officer of Railways, Lt Colonel McNaughton, told the IRRS London Area that they reckoned to be able to put in a basic link in a couple of weeks. War does concentrate the mind? What was he thinking of..... Sligo - Ballyshannon? I wonder was the idea to do 3ft gauge from Sligo to Derry via Strabane? An interesting concept for a model, of ever there was one! 3ft gauge American-built diesels coming in, maybe in 1943/4? I think we're (you are?) talking at cross purposes. The idea was to link Kingscourt to Carrickmacross - a very short distance. Of course, then Inniskeen would have sensibly have been relaid as a triangular junction to aid access to the North via Castleblaney and Keady (roundabout and a pig to work, I would think) but in wartime, needs must. After all, in WW1, the coal for the Grand Fleet came from South Wales over such exotic lines as the Manchester and Milford in central Wales to gain routes North to Scotland and Scapa Flow. I wonder what they did during the weeks the Fleet was in Lough Swilly? Ah! G ot you - yes, I misunderstood. Yes, that would seem logical - the old Derry Central seemed to have little sidings to military establishments all over the place - like those strange little lines which branch off Swiss main lines today and promptly disappear into a mountain! Think of it - if the Wee Man from near Salzburg had invaded Home, we could have had Woolwich moguls pulling trains of British tanks on low loaders on both sides of the Irish Sea. Gives a whole new meaning to Second Front? Getting back to the theme of the County Donegal railway the CDRRL have just launched a crowdfunding campaign to complete the cosmetic restoration of Drumboe by the RPSI before bringing it back to Donegal Town. See the CDRRL website for details of how to support this scheme.